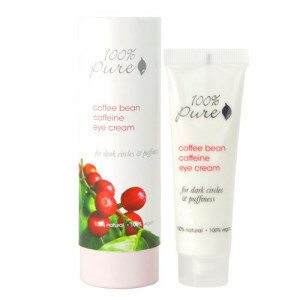 Our 100% Pure Organic Coffee Bean Caffeine eye cream contains anti-inflammatory, caffeine rich green tea and coffee which improves the appearance of puffy under-eyes, and brightens dark circles. It is concentrated with potent anti-aging vitamins, antioxidants, and nourishing rosehip oil to make eye area appear more awake and more youthful. EXCELLENT product! Calms the skin around my eyes and is gradually diminishing my dark circles, which I was skeptical it could/would do. It does! Highly recommend.